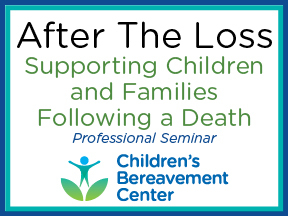 This presentation of “After the Loss: Supporting Children and Families Following a Death” will focus on the developmental impact of a death experience, manifestations of grief, neurobiological effects of grief, standards of care, and factors relevant to working with bereft children, adults and families. Medical Professionals, Clinicians, Mental health professionals and others working with grieving children/families will benefit from the content and skill development offered through this seminar. Educational information will be provided about bereavement in children/families, as well as tools and resources available for helping those experiencing loss, including the professionals themselves. Content will be provided in a lecture based format with opportunity for experiential activity, questions and discussion from attendees. Mindy Cassel, Ph.D., C.T., is Chief Executive Officer and Co-Founder of the Children's Bereavement Center® (CBC). She is a Licensed Psychologist and Thanatologist. Since 1999, as Executive Director, she oversees CBC's operations, management, strategic planning, financial development, and expansion. Dr. Cassel's professional career in the Miami community spans more than 30 years, during which she has worked with individuals, families, and children in the areas of loss, trauma, rehabilitation, and life transition. Dr. Daniel Sheridan is the Chief Program Officer of the Children’s Bereavement Center, where he is responsible for the CBC Peer Support Group Services, community outreach and training, and the dissemination of CBC outcome research. He received his doctoral degree in Counseling Psychology from the University of Miami. Dr. Sheridan is trained in both clinical work and empirical research. Clinically, he has provided therapeutic support to children and adults in both individual and group settings. Dr. Sheridan is also a published author and invited presenter at both national conferences and community agencies within South Florida.